Born into slavery in 1760, Richard Allen purchased his own freedom for $2000 at the age of 20. He became a devoted Methodist preacher and founded the Mother Bethel African Methodist Episcopal Church in 1794. The American Revolution, as an anti-tax movement, centered on Americans' right to control their own property. In the 18th century "property" included other human beings. In many ways, the Revolution reinforced American commitment to slavery. On the other hand, the Revolution also hinged on radical new ideas about "liberty" and "equality," which challenged slavery's long tradition of extreme human inequality. The changes to slavery in the Revolutionary Era revealed both the potential for radical change and its failure more clearly than any other issue. Slavery was a central institution in American society during the late-18th century, and was accepted as normal and applauded as a positive thing by many white Americans. However, this broad acceptance of slavery (which was never agreed to by black Americans) began to be challenged in the Revolutionary Era. The challenge came from several sources, partly from Revolutionary ideals, partly from a new evangelical religious commitment that stressed the equality of all Christians, and partly from a decline in the profitability of tobacco in the most significant slave region of Virginia and adjoining states. The decline of slavery in the period was most noticeable in the states north of Delaware, all of which passed laws outlawing slavery quite soon after the end of the war. However, these gradual emancipation laws were very slow to take effect — many of them only freed the children of current slaves, and even then, only when the children turned 25 years old. Although laws prohibited slavery in the North, the "peculiar institution" persisted well into the 19th century. 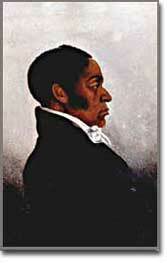 James Forten was a noted Philadelphia businessman and abolitionist. Even in the South, there was a significant movement toward freeing some slaves. In states where tobacco production no longer demanded large numbers of slaves, the free black population grew rapidly. By 1810 one third of the African American population in Maryland was free, and in Delaware free blacks outnumbered enslaved African Americans by three to one. Even in the powerful slave state of Virginia, the free black population grew more rapidly than ever before in the 1780s and 1790s. This major new free black population created a range of public institutions for themselves that usually used the word "African" to announce their distinctive pride and insistence on equality. Richard Allen founded the African Methodist Episcopal Church. 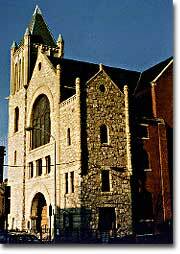 The most famous of these new institutions was Richard Allen's African Methodist Episcopal church founded in Philadelphia. Although the rise of the free black population is one of the most notable achievements of the Revolutionary Era, it is crucial to note that the overall impact of the Revolution on slavery also had negative consequences. In rice-growing regions of South Carolina and Georgia, the Patriot victory confirmed the power of the master class. Doubts about slavery and legal modifications that occurred in the North and Upper South, never took serious hold among whites in the Lower South. Even in Virginia, the move toward freeing some slaves was made more difficult by new legal restrictions in 1792. In the North, where slavery was on its way out, racism still persisted, as in a Massachusetts law of 1786 that prohibited whites from legally marrying African Americans, Indians, or people of mixed race. The Revolution clearly had a mixed impact on slavery and contradictory meanings for African Americans. Richard Allen seized the opportunities that post-war freedom presented and organized the African Methodist Episcopal Church in 1816. From humble beginnings in an abandoned Philadelphia blacksmith shop, the A.M.E. has spread worldwide to include over 3,600 churches. Visit their official site and get more on their history, Richard Allen and other founders, and news on the church today. Richard Allen's African Methodist Episcopal church was undoubtedly a valuable contribution to society, but that was not his only legacy. Allen helped to build an identity for African-Americans by creating separate African-American institutions and rejecting campaigns to return blacks to Africa. This important essay from The Early America Review highlights Allen's influence on both the church and greater society. This one page overview of colonial African-American life outlines the hard choices that slaves faced at the onset of the revolution. Should slaves run away to join the British forces? Or should they take up arms against the British in hopes that an American victory would ensure their freedom? Not much here on the African-American experience after the war, just a look at the first round of revolutionary era challenges. The 1786 Massachusetts law prohibiting mixed marriages was just one of many statutes resulting in increased division between American citizens. Over time, other states added similar laws. It wasn't until the Loving vs. Virginia decision of 1967 that the U.S. Supreme Court nullified mixed marriage laws still in effect in 16 states. Read the text of that decision at this Association of MultiEthnic Americans page. When Richard Allen and Absalom Jones teamed up to form the Free African Society in 1787, they originally hoped to establish some sort of "religious society." Instead, their group evolved into a mutual aid society that collected money from members to help less fortunate African-Americans. Get more on the Society's history and read the text of their Preamble at this PBS Online site. Despite America's efforts to return them to slavery after the War, over 3,000 African-Americans who had fought for the British, won passage to Nova Scotia, Jamaica and Britain.